September 30 2018. 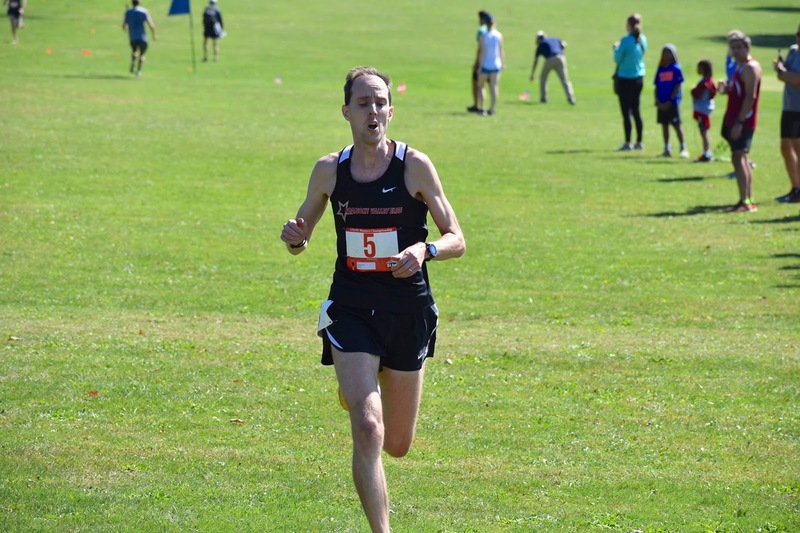 BUFFALO NEW YORK – Sunday, September 23rd was a beautiful day for watching Cross Country Races. As the morning wore on to midday, the temperatures at Delaware Park had risen to 64 degrees under fair skies. The combination of sun and mid-60’s was slightly warmer than ideal, but this is about as good as it gets for Cross Country! There had been no rain earlier in the week, so the footing was excellent, with no muddy patches. It was golf course grass with one exception where runners were shunted onto a gravel path for 20-30 meters. Two 2.5 Km loops around a golf course made up the 5 Km course. With few elevation changes, this course should have been about as fast as they come for Cross Country. Of course, cross country distances are measured carefully, but not as precisely as for a road course certification, especially when there is no chalk line to measure along. The consensus among the runners, based on their GPS readings, was that the course was about 3.2 miles, a tad long. If they are right, someone averaging 5 minutes per mile would have taken an extra half minute or so; at 7 minutes per mile, it would be close to an extra 45 seconds. The first two races of the day, the Men’s 60+ and the Men’s 50+, were covered in recap #1. 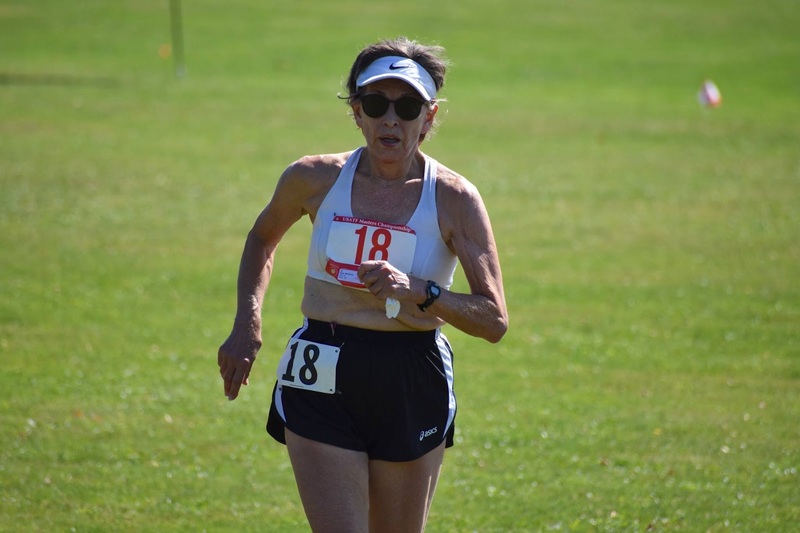 This installment will cover all age groups for Women, who ran in a single race, and Men 40+, who ran separately from the 50+ and 60+. Officials had to decide on those details early on; as it turned out the races were reasonably evenly subscribed. 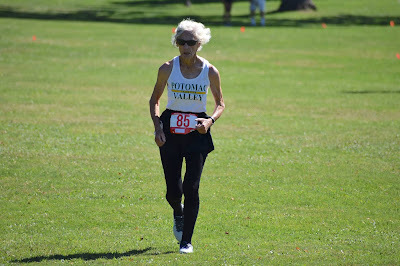 Sixty women ran; 34, 49, and 74 men respectively ran in the Men 40+, 50+, and 60+ races. A final report will cover Age Grading and Teams. 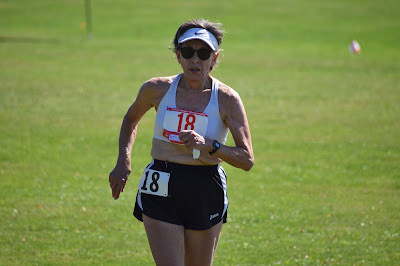 The Women’s race went off at high noon, which included competition for all 5-year age divisions 40-64 through 80-84 as well as team races for 10-year age divisions 40+ through 70+. 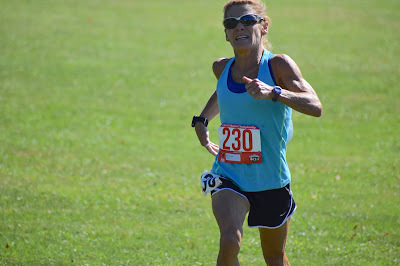 Jill Braley celebrated her 40th birthday on the day of the race and so was eligible to run in her first race as a Masters athlete. And as is sometimes the case, she snuck in under my radar. I knew she had run under 20:00 in recent 5Ks but I should have paid more attention to the 5K races earlier this year and last year where she broke 19 minutes. 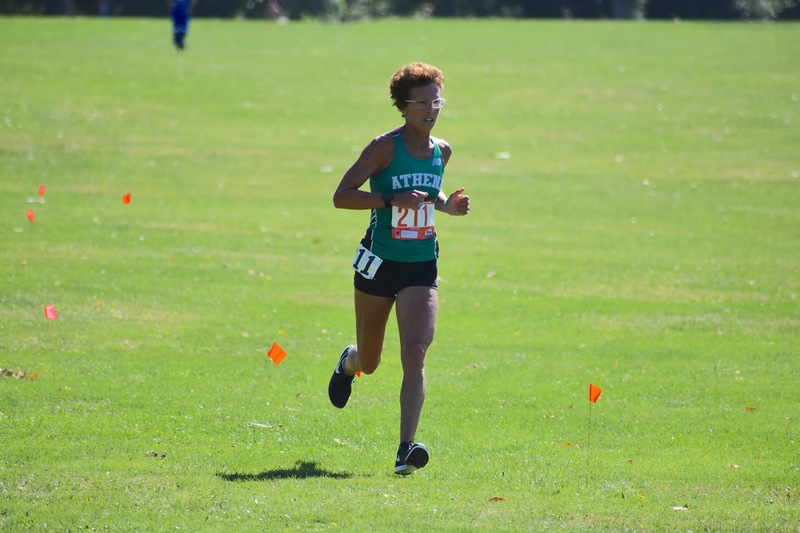 Once it was known Kathy Wiegand would not be running, I had it as a race between Heather Webster, Sunday Patterson, Heather Patterson, Murphee Hayes, and Liz Gottlieb. 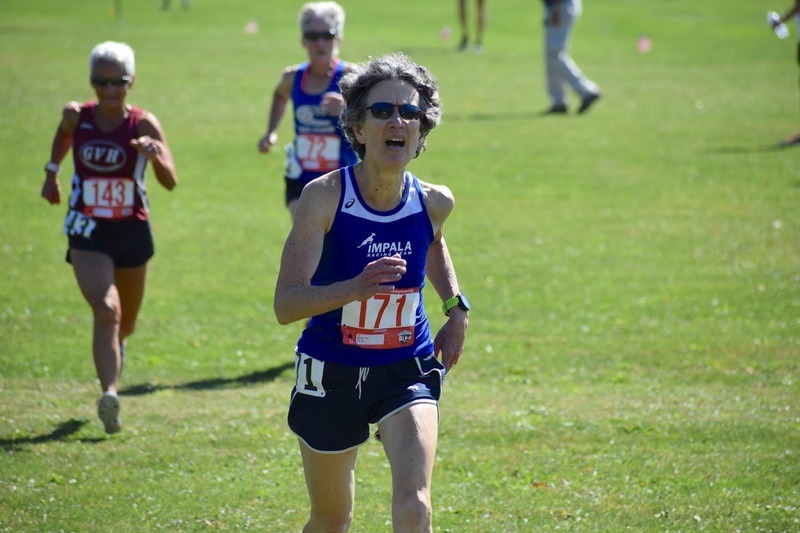 Braley was having none of that as she raced out alongside her teammate from the 45-49 division, Sonja Friend-Uhl, both in the hunt for the race victory. 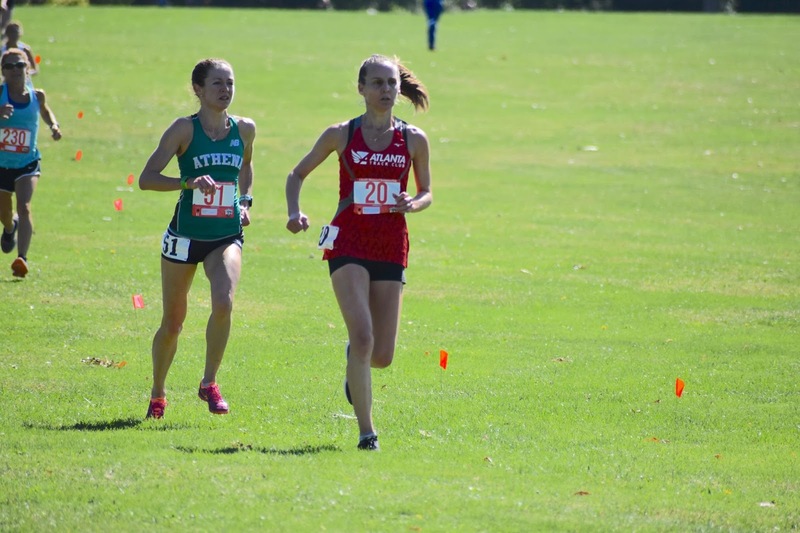 By the time they reached the transition area between the two loops, Friend-Uhl had about 20 meters on Matisa Sutera Strange, the gifted runner from the 55-59 division; Strange, in turn had about 15 meters on Braley. In terms of the division race, Braley had a similar margin on Webster in 2nd, followed a few strides later by Gottlieb in the division 3rd place. Those three 40-44 runners had opened up a substantial gap over the chasers, led by S. Patterson, M. Hayes, and H. Patterson. By the end of the 2nd loop, Braley had extended her lead over Webster to 47 seconds. 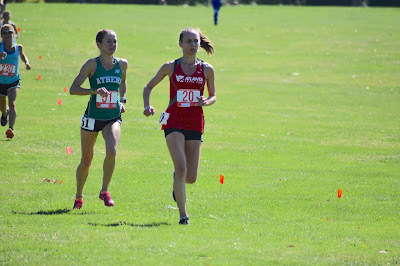 But Webster hung tough in 2nd, putting added distance between her and Gottlieb, who wound up 23 seconds behind in 3rd. This division contained two of the contenders to win the Women’s race, Sonja Friend-Uhl and Abby Dean. Caroline Bucci and Alexandra Newman were expected to contend for the final podium spot. I thought Olga Huber and Melissa Senall had a chance, but it was not their day. As mentioned above, Friend-Uhl had the lead at the end of the first loop. Dean was just a step back from Braley, so about 15 meters back from Friend-Uhl. It was a substantial distance back to Newman who had several strides on Bucci at that point. Dean ran well over the 2nd loop but could not cut into Friend-Uhl’s lead, which was 26 seconds at the finish line. Bucci was able to overtake Newman and carved out a half minute gap to take the Bronze Medal. 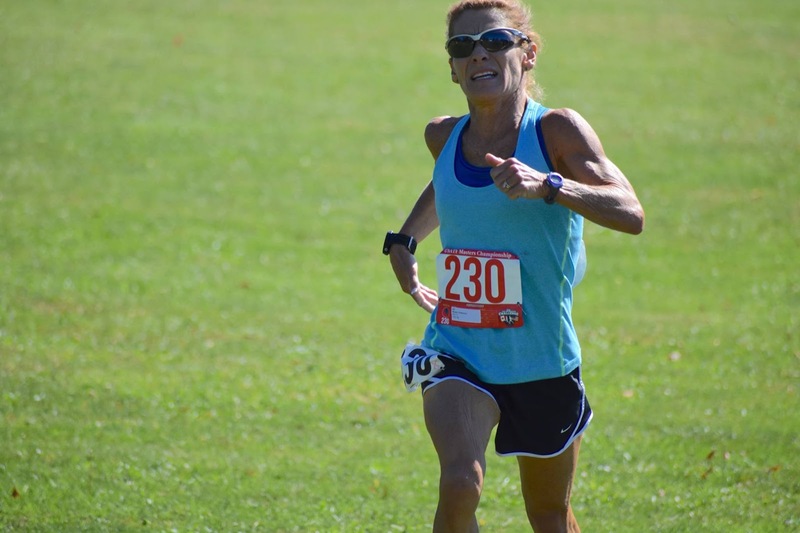 Friend-Uhl repeated her win from the 5 Km Masters Championship in Tallahassee in 2016. Dean showed that she is a tough competitor in Cross Country now that she is back on her game. 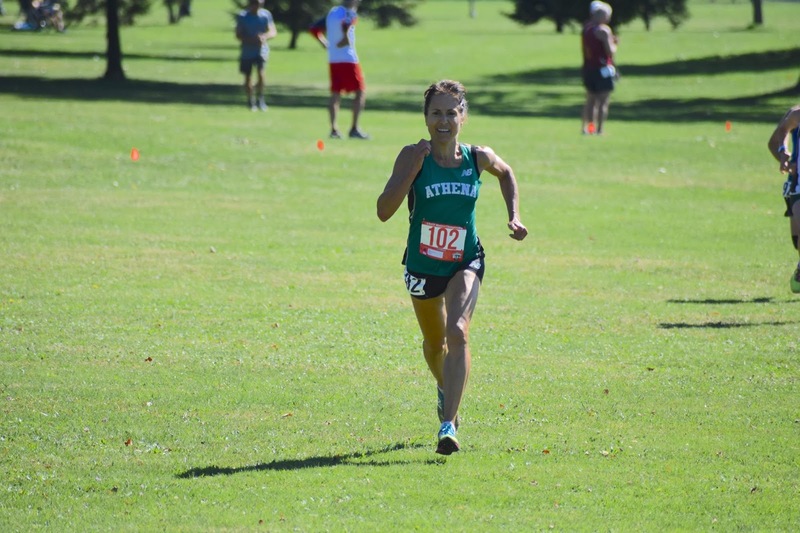 The race unfolded much as expected with Katherine Wolski going out among the top 5 and holding that position throughout, although Amy Fakterowitz was still only a few strides back at the end of the first loop. It was a good distance from Fakterowitz back to Michelle Rohl who was in third. Fakterowitz’s teammate, Elizabeth Randell, was about 30 meters further back but had Rohl in her sights and hoped to move up. As it turned out, all 4 ran a strong enough 2nd loop and maintained position. Wolski pulled away and enjoyed a victory where she did not need a finishing kick to win. Fakterowitz was over a minute behind, as she hung tight for 2nd. A fast second loop for Rohl left her just 19 seconds back from Fakterowitz, with over a half minute margin over Randell who finished in 4th. 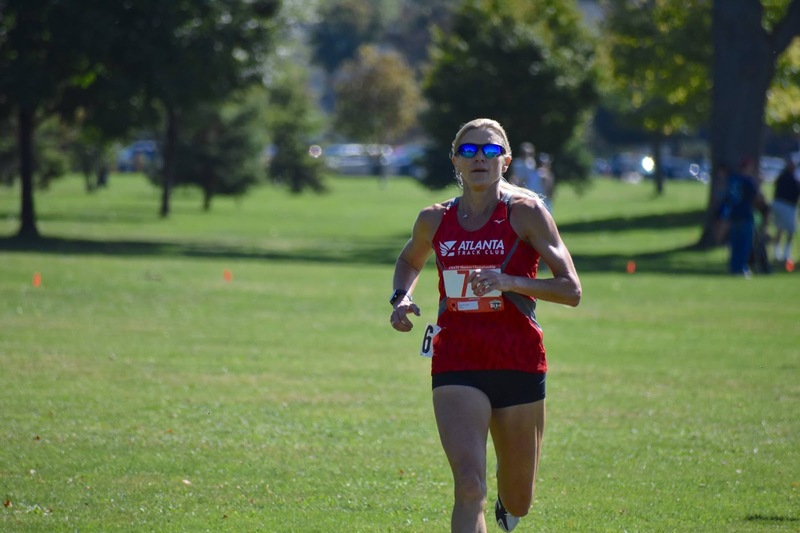 Marisa Sutera Strange was the strong favorite and she did not disappoint, showing she is back on her game after an off day in Atlanta at the 5K road championships and a return to form in the mile, but still a loss to teammate, Doreen McCoubrie. 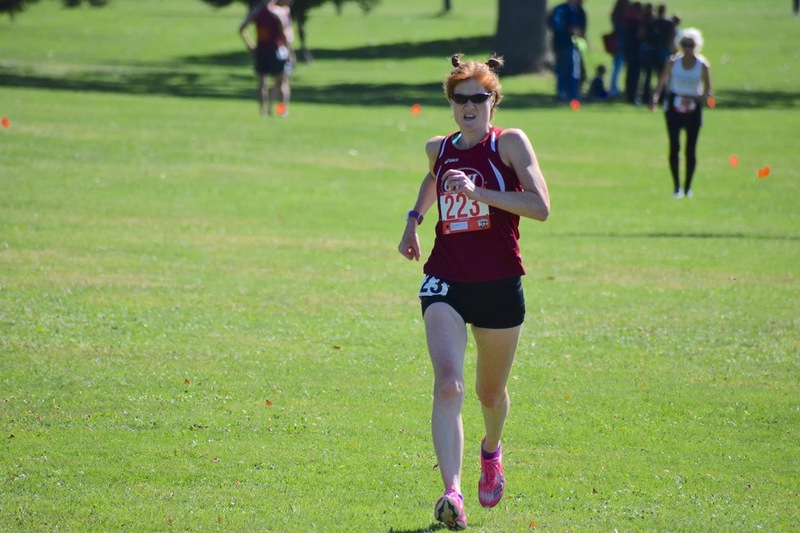 Here Strange would be looking to see if she could get a top 5 finish as she did at the Cross Country Nationals in Tallahassee earlier in the year and at the 2017 edition of this Championship in Boston last year. Strange was in 2nd overall at the end of the first loop, but with 3 speedsters from younger divisions not far behind. In the end, Strange gritted her teeth and held on to take 5th overall. 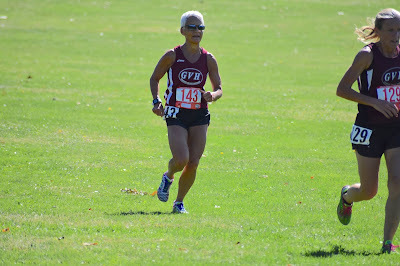 In the meantime, she was winning her 55-59 age division by a substantial margin. At the end of the first loop the chase group was well back. Lorraine Jasper had pulled out to lead the chasers, with Karyl Sargent 10-15 meters back, followed by Suzanne Cordes, with Mary Swan just a few strides back. Not only did Strange finish 3rd in the Women’s race, she easily took the win in the division, finishing nearly a minute and a half in front of the division field. Jasper held tight to the end, fending off a challenge by Sargent to take the Silver Medal by 6 seconds! Swan passed Cordes on the second loop to take 4th twenty seconds back. Cordes ran into difficulties on the second loop and did not enjoy the kind of race she had in Atlanta over the final half of the race. Believe it or not, this was the closest race of the day as the first 3 athletes in the Championship finished within 2 seconds of each other-Wow, that was close! 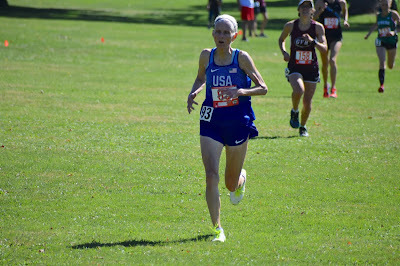 Sharon Moore set the pace on the first loop; she was gunning for the win! She had a gap on Ruth Rainero who was followed closely by Patricia Ford, and then another gap back to Cheryl Guth in 4th. The 2nd loop was thrilling as Rainero and Ford both closed on Moore. Who would have the strongest kick? In the end, Rainero had just a little bit more in the tank as she won by a single second. Moore was able to hold on for second place, with Ford a single second behind her in third. Guth came in 4th. This division was the antithesis of the previous one. Not surprisingly, 2017 Runner of the Year, Sabra Harvey, was unchallenged, winning by over 6 minutes. 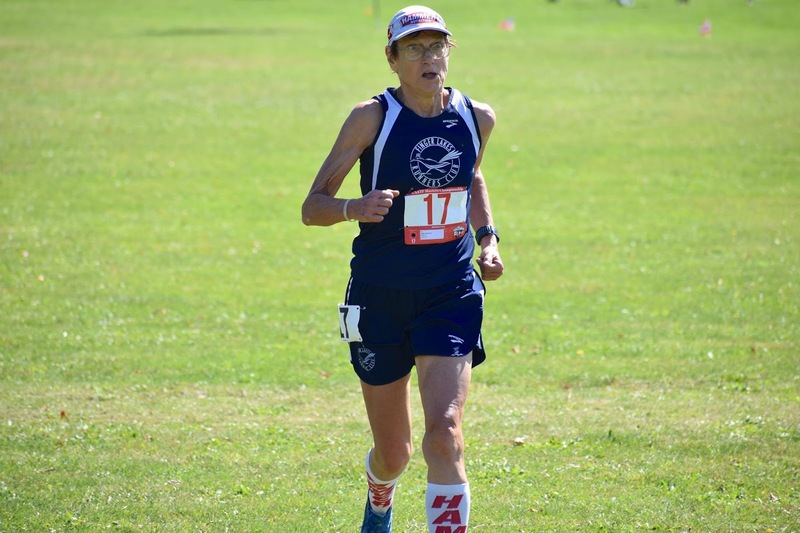 Sabra Harvey, 2017 USATF Masters LDR Runner of the year, wins her age division easily while claiming the top Age-Grading spot overall at the same time. Cindy Ingalls came in well ahead of her teammate, Jeanne Herrick, as they enjoyed 2nd and 3rd place finishes in the division. Linda Rock placed 4th. but Georgia’s Leslie Brass and Kentucky’s Terry Foody had an SEC battle going on that went to Brass by a mere 5 seconds! Carol Rhodes took 4th. was less than 3 minutes back, much closer than in Atlanta. Like Radle in the 75-79 division, Tami Graf pocketed her third straight win on the Championship circuit. 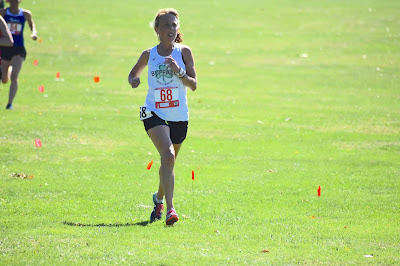 Graf had no trouble as she won the division by over 6 minutes. Edna Hyer took 2nd and enjoyed herself tremendously, competing in the race with many long-time rivals and friends. The Men's 40+ race started at 12:45 pm, with the warmest weather of the day. David Angell wanted the trifecta, to win the 40+ race, the Can-Am Challenge and the Age Division. His pre-race research suggested that Michael Gill of Canada could be a threat. Apparently he recently ran a 5000 meter on the track in 15:10. And in the race to win 40+ he had to worry about Philippe Rolly. That gave Angell all the incentive he needed to get out fast and settle into the kind of pace that tends to discourage all but the best XC Masters runners at 5:09-5:10 per mile. Despite Rolly’s best efforts, Angell had opened a gap on him by the end of the first loop. Gill was a few strides behind Rolly, with Brian Lombardo another step and a half back. Then there was another gap to a chasing pack led by Jake Stookey. 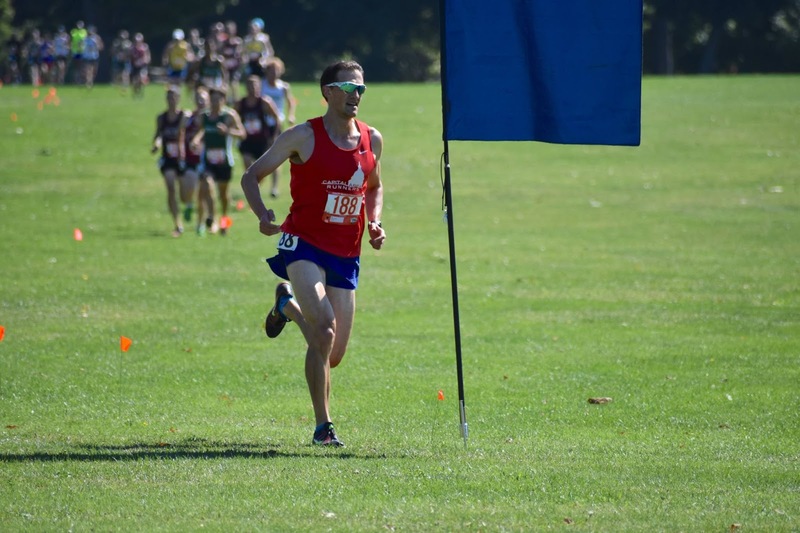 Jake Stookey 210 leading the Men's 40+ Chase Pack on his way to a 2nd place finish in the Men's 40-44 Division at the 2018 USATF Masters 5 Km XC Championship in Buffalo NY. Kirt Komocki 113 and Tim Rieth 184 kept pace. 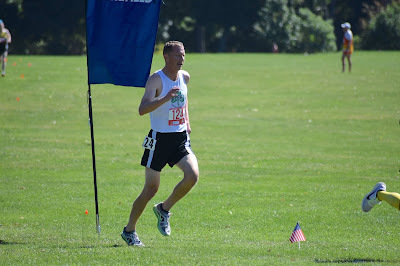 It was good to see Stookey back running strong after some slow times recently due to injury. Angell said he definitely slowed in the third mile before picking it up again with the last 600 meters in front of him. He kept both Gill and Rolly at bay, not to mention Lombardo and Stookey, so he achieved his goal of 3 wins in one race! Stookey ran strong over the second loop, catching Lombardo and pushing past to build a 16 second gap in taking 2nd place. Lombardo toughed it out to take 3rd, with Tim Rieth 18 seconds back in 4th, followed 8 seconds later by a trio who finished inside a 5 second span-Michael Selig, Shawn Williams, and Josh Harter. Angell commented after the race that he also had an eye on closing out the Individual Grand Prix contest; with this win, he has 500 points, and no one can catch him. That takes the pressure off, so he can enjoy the 15K in Tulsa, the last race of the 2018 series. As noted above, Philippe Rolly would try to stay with Angell to challenge for the M40+ victory, as well as an Age Division Gold Medal. 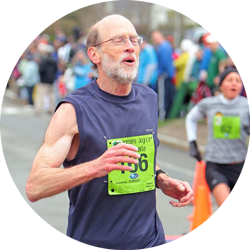 But he would face a group of 3 speedy runners who would challenge him in the division, Kevin Burke, Jonathan Frieder, and Kirt Komocki. Frieder has proven himself to be a tough competitor for Rolly on the roads. 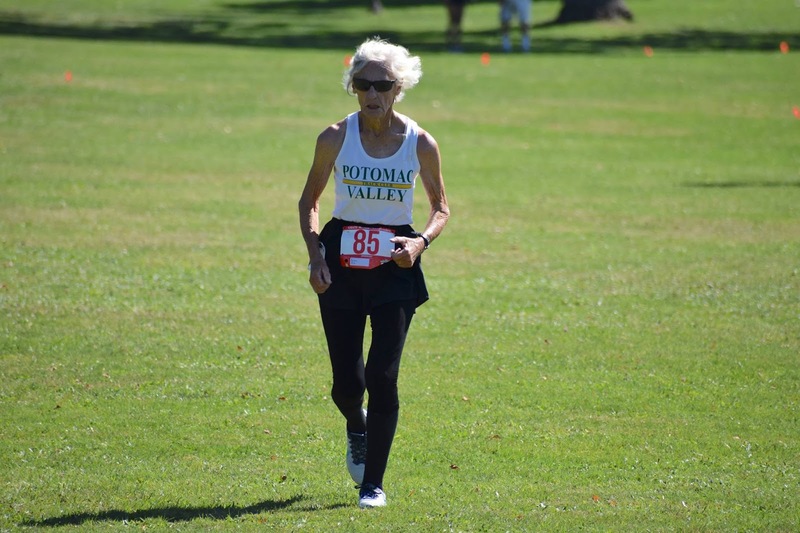 Frieder was only 12 seconds back from Rolly at the 8K Championship in Virginia Beach and was even closer at the 10K Championship in Dedham, where Rolly had only a 3 second margin over Frieder. 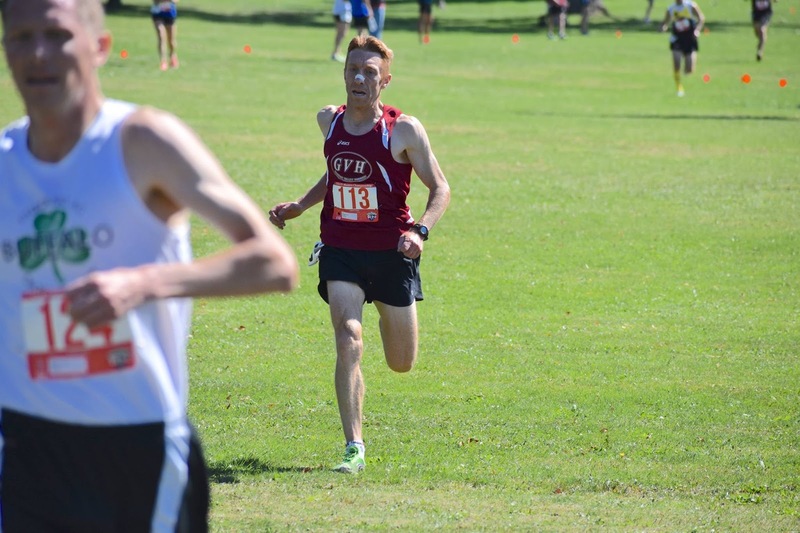 In their only meeting at USATF Cross County Championships, Rolly had an edge of over a minute. Komocki and Burke do not have the road credentials of those two but may be stronger on the turf. Burke and Komocki would also have the incentive of running for their respective team, GVH and Checkers AC, while Frieder’s team, the Garden State Track Club, had clinched the Men’s 40+ Club Grand Prix title already and did not bring a full team. Rolly, in getting out with Angell for the first portion of the race had a gap on the rest of the field by the time they came to the transition to the 2nd loop. Komocki was running alongside Stookey, at the head of a chase pack that included Frieder. Burke was biding his time a bit further back, hoping to move up over the 2nd loop. 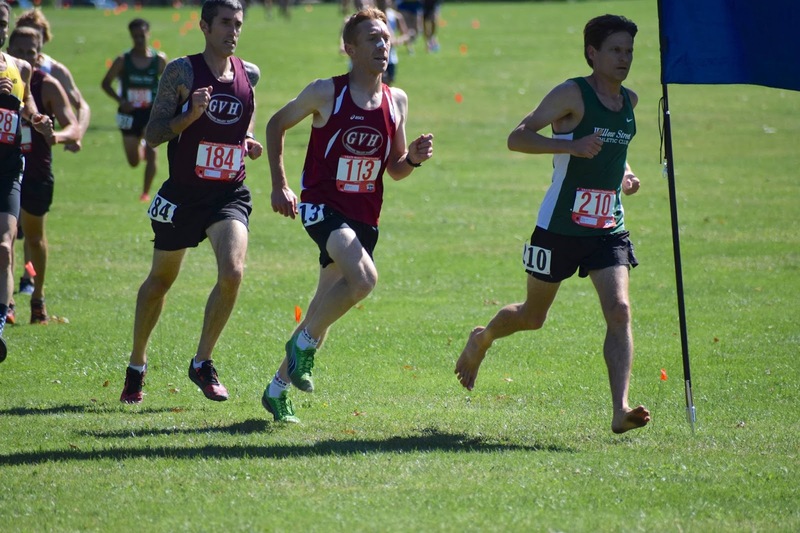 All four of those runners held their place on the second loop. Rolly had 16 seconds on Komocki at the finish line, with Frieder another 14 seconds back. Burke never got untracked, finishing just off the podium 22 seconds behind Frieder. Not only does this give Rolly the Masters 5 Km XC Championship, it also moves him within striking distance of Frieder for the 2018 M45 Individual Grand Prix title. Rolly is entered at Tulsa needing to finish third or higher to take the Grand Prix title from Frieder. That assumes Frieder does not run Tulsa; Frieder could enter yet and try to beat Rolly for the first time this year--he should have a better chance on the roads. 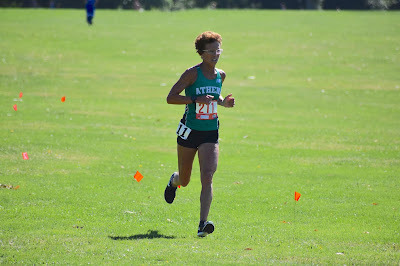 The last installment of the Masters 5 Km XC Championship recap will cover Teams and Age-Grading.